Should you get the chance to venture into the Fly Fishers' Club in Mayfair, you will find two very large stuffed brown trout caught on the Kennet in Kintbury. Both were had by W. H. Barrett, believed to be the same man that invented The Shaving Brush fly. The first, weighing 5 lbs, was caught in 1917 and the second, an absolute beast of 7 1⁄2 lbs, was caught two years later. The River Kennet is a chalkstream sometimes regarded as the ugly sister to the likes of the Rivers Itchen and Test. Indeed, George Skues even referred to the middle Kennet as dour. Unfairly so in my opinion (and perhaps that of Barrett too). I have been fortunate to live on the banks of the River Kennet since 1993 when we moved to Barton Court in the village of Kintbury, which sits between Hungerford and Newbury, and the house lies no more than 100 yards from the banks of this “dour” stretch. Even though Skues felt this stretch of the river was poor, with “the quantity of subaqueous food so large as to keep the trout down”, other inspirational fishermen have enjoyed the river and what it has to offer. Frank Sawyer taught at the Marlborough College summer school; Halford had a lease on a substantial stretch of the Kennet; and John Goddard had a 20-year lease on the “Wilderness” beat, just downstream of Barton Court. So, it surely can’t have been all that bad, George! At the time we moved to Kintbury, I was 13 years old. We moved here from the south of France where I would be out fishing at any opportunity albeit the catch was limited to small Mediterranean fish using a short pole and bread paste for bait. Imagine my excitement to find my new home had a river full of fish at the bottom of the garden. Excitement quickly turned to frustration when I found out the fishing rights did not come with the house. Fortunately, there was some respite in its former use as a prep school, complete with a river-fed swimming pool at the bottom of the garden. By the time I moved in it was heavily silted and a fine home for a few perch, roach and the occasional small pike. I would often drag a spinner through the pool, hoping for a pike, but if nothing showed any interest a few “stray casts” would end up in the river proper, often earning me the wrath of the riparian owner. This is where I caught my first trout. At the time I was disappointed it wasn’t a massive pike, but it was truly the most beautiful fish I had ever seen. It’s the angry red spots I remember the most vividly, set within its burnished copper flanks. I would like to say that it was at this moment that I got the trout fishing bug. Sadly, and much to my eternal regret, it wasn’t for another 10 years or so before fly fishing became a serious hobby. This despite being a former pupil of Marlborough College, with access to their private stretch of Kennet and two trout lakes.... peer pressure I guess! Fast forward to the present, and the opportunity recently arose for my stepfather to buy the freehold of the land surrounding the house, including the fishing, which continues to be subject to a sporting lease until February 2018. I am extremely excited at the prospect of the fishing rights coming back in hand in time for the next trout season, as over the last 15 years I have become a crazed fisherman, travelling far and wide to chase my quarry, much to my girlfriend’s chagrin. The leaseholder has also forgiven me for my errant and excitable casts as a youngster and I have enjoyed many successful seasons fishing here at Barton Court. This stretch of the river has a huge amount going for it. It is conveniently located on the edge of Kintbury Village which benefits from a popular pub and direct train line to London Paddington (59 mins). The river is a Site of Special Scientific Interest (SSSI) and it is located within an Area of Outstanding Natural Beauty (AONB). The water itself is wonderfully varied, with approximately three miles of fishing bank. There is an abundance of wildlife including nesting kingfishers, water voles, several species of birds of prey and an elusive otter (somewhere – never seen, but the signs are all there). There is even a unique strain of brown trout native to the river, the Kennet greenback, although I have yet to catch one. However, we appreciate there is plenty to do and improve. The beat has probably missed the care of a full-time river keeper over the last 25 years. Flows could be improved through better management and weed growth encouraged. To help us achieve this, we are delighted to have Nick Richards starting as river keeper in October 2017. He has a vast amount of experience and joins us having been a lecturer at Sparsholt College. 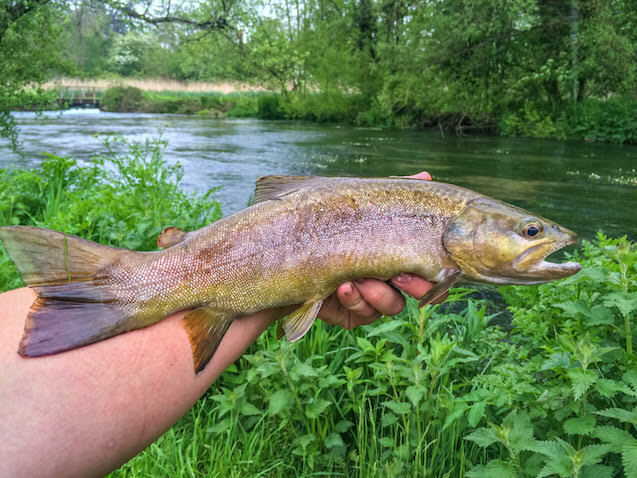 Previous roles included head river keeper on the Testwood and Nursling beats of the River Test and river keeper for the Salisbury and District Angling Club. One hell of a CV! Nick is passionate about the southern chalkstreams and is very excited to be getting his teeth stuck into the habitat restoration, something he has advised on his entire career. We are hoping to promote better habitat for invertebrates and wild fish along the length of this stretch. We are also hoping to work closely with Action for the River Kennet (a member of The Rivers Trust, and a registered Charity - no: 11207525) who are doing fantastic work caring for the river, particularly in the upper stretches around Marlborough, but more and more so on the middle Kennet. So, whether those stuffed fish in Mayfair were caught at Barton Court or on The Wilderness beat I don’t know, but big wild fish have thrived in this part of the river, which makes me think (and hope) they can thrive once more. I would love to one day see five-pound plus wild brownies on this wonderful river, and maybe a few more of the native Kennet greenback.